As a kid, Reed Richards (Miles Teller) was almost obsessed with finishing his machine that would be able to teleport objects to other locations. Ben Grimm (Jamie Bell) was a boy in Reed’s class. Ben helped Reed complete his machine and was the only one to see it in action. When they got to high school, Reed and Ben displayed the machine at the science fair. During the science fair, Reed was approached by Dr. Franklin Storm (Reg E. Cathey). Dr. Storm and his adopted daughter, Sue (Kate Mara), were working on a similar machine, but have been unable to make it work. Dr. Storm invites Reed to come to the Baxter Foundation to continue his work with the Baxter team. Dr. Storm has also brought on Victor von Doom (Toby Kebbell), who had previously worked on the teleporter. Dr. Storm’s son, Johnny (Michael B. Jordan), is also added to the team, as penance for his troublemaking. Reed, Victor, Johnny, and Ben decide to take it for a spin for themselves. Things take a turn for the worst and the team finds themselves with special powers. When they return, the government, seeing their powers, decides they should find a way to weaponize them. Reed must find a way to rescue his friends from the clutches of the government facility. I think we have reached the point where we should abandon all hope of a good Fantastic Four movie. After two less-than-stellar movies, The newest reboot takes the mediocrity we had in the previous movies to a new low. Perhaps the most insulting thing about Fantastic Four is trying to sell the 28 year-old Miles Teller and 29 year-old Jamie Bell as high schoolers. I don’t know why they needed to include the high school science fair as part of the story. They could have easily made them college students and made it more believable. Perhaps they were trying to play up Reed’s prodigy status. I don’t know. But it doesn’t work. And things go downhill from there. It’s not that director Josh Trank was given a bunch of B-listers to work with. Miles Teller has proven that he is more than capable. Kate Mara, Jamie Bell, and Michael B. Jordan aren’t bad either. I think the biggest problem is the material they were working with. Instead of the action-filled backstory we have come to expect from superhero movies, we are given an hour and a half of build up with no payoff. There is a 3 minute battle against an “enemy” who isn’t really given an explanation. That is followed by a completely unsatisfactory ending, complete with the cheesy way the team comes up with the Fantastic Four name. On top of that are the special effects. The CGI is completely overused, and poorly done. When Johnny “flames up,” it looks ridiculous. The Thing (worst superhero name and powers ever), who has decided he doesn’t need pants, is a cheap ripoff of the Hulk. And I’m including all the Hulk’s stand alone movies. Sue’s fading in and out of visibility could have been done by a film student. It’s all just so bad. Fantastic Four currently sits at a 9% rating on Rotten Tomatoes, and it is easy to see why. This could possibly be the worst superhero movie to date. 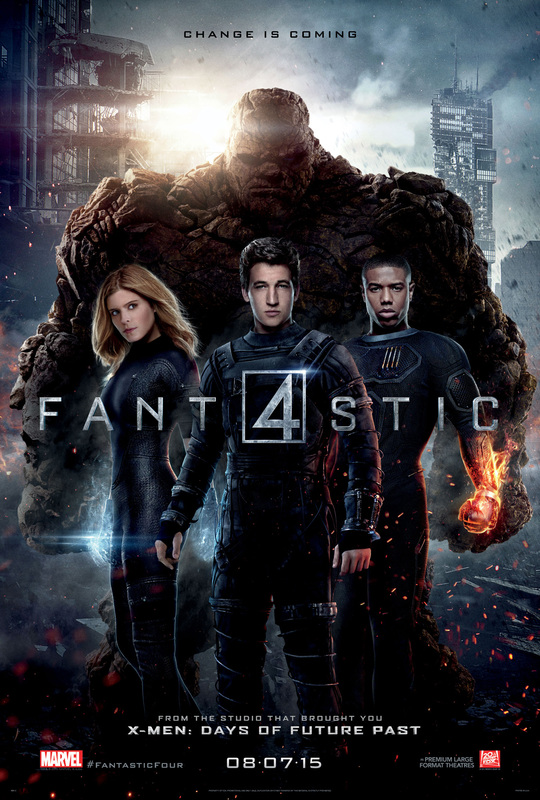 It makes the previous Fantastic Four films look good. And that’s saying a lot. If you are tempted to see this movie, even out of morbid curiosity, as I did, don’t. It isn’t worth it. I’m hoping the scheduled sequel won’t go anywhere and that we just bury this embarrassing chapter. Maybe they can fill the spot slated for the sequel with a Wonder Twins movie. It couldn’t be any worse.